When Fiona Anderson was expecting her third baby, doctors had predicted looking at the scans that she might have a big baby. But Hugh Donald Evans stunned even his mother when he arrived weighing 13 pounds and 10 oz becoming one of the biggest babies born in UK. For the doctors at the Raigmore Hospital in Inverness too it was a novel experience because they are used to seeing babies half the size of Hugh. 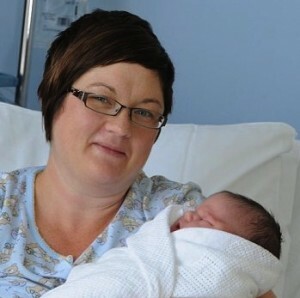 Fiona, who also works as a theatre nurse at the same hospital had a caesarean section and the doctors claimed that they had never delivered a heavier baby. Also mother to Rhys, 6 and Cerys, 2, Fiona admits though that she is used to having heavy babies. “When my eldest son Rhys was born, he weighed 10lb 5oz and when Cerys was born, she weighed 10lb 1oz. All the children were born by C-section so I was scheduled in for a C-section anyway with Hugh,” she said. Fiona was suffering from gestational diabetes during her pregnancy and it is believed that the baby received too much glucose inside the womb which led to his huge size. Right after birth Hugh was transferred to the special care baby unit (SCBU) because he was having trouble keeping his sugar levels up after birth. The nurses though are finding his presence at the SCBU a bit odd as they are used to seeing much tinier baby than Hugh at the special unit. ”In the SCBU it’s normally just tooty wee babies that are there, so Hugh looks a bit out of place.The SCBU nurses were saying it’s the biggest baby they’ve seen and the staff who delivered him at Raigmore were saying the same thing,” said the new mother. Recalling the moment of birth Fiona says how she and her partner Glyn Evans were more interested at knowing the gender of the child than his size. It was only moments later when the nurse revealed his birth weight that they knew that they had received a really big bundle of joy. The new mother says there are good points about Hugh being on the heavier side as then Cerys her two year old won’t be able to pick baby brother so easily. But the same problem may arise for Fiona too as the baby begins to grow. For now the family is just happy giving ‘giant’ hugs to their baby boy.